Slythe's ancestors at one point have been tall and slender through their days on the surface of the land, until they had been placed within the caves to work and mine. After several decades the once regal frame of her clan had changed to that of a shorter stature. Slythe stands at fourteen point three hands gifted a strong back and hindquarters. While her coat base is a near white-blue ghostly in nature. Her skin is nearly translucent giving a more ethereal appearance while her more tender parts her pink skin can be seen. She has rather normal sized ears, but she does have two sets of milky-white-silver eyes that are pupil-less. She can see perfectly fine in the night, but the daylight tends to blind her unless she is in the shadows. Because of the near translucent of her skin the sun tends to burn her hide this is a result of living majority of her life within the darkness of the caves. Her entire coat sparkles like the stars a bioluminescent from living within the dark. Slythe was born without a mane. 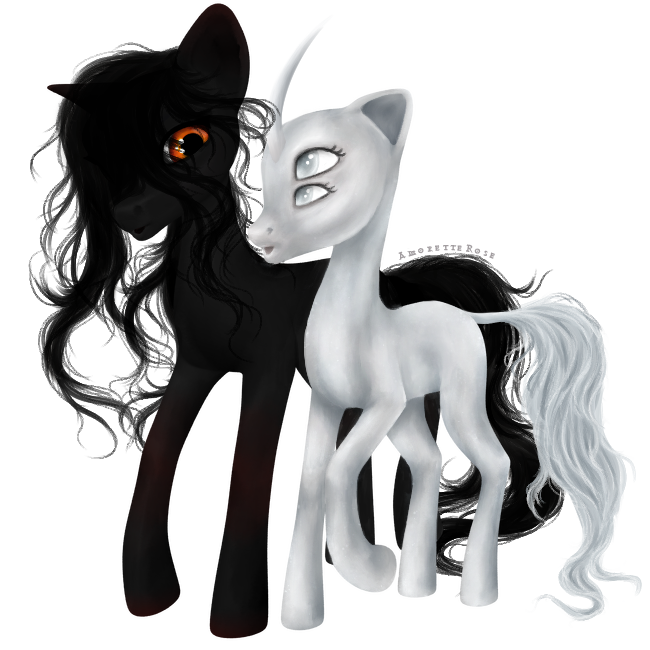 Though she does have a short thick unicorn tail with a large mass of hair that tends to drag the ground as she walks. Her hair is a off-white-blue like her base. Atop her cranium sits one unicorn horn long and slightly curved toward the back. 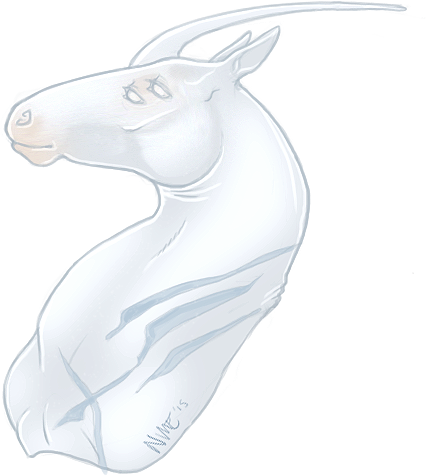 The horn gives off a slight eerie glow in the dark, but so do the small moons that can be found on her hooves. Scar tissue turns a deeper blue. Slythe is insecure of herself with the social normality seen in everyday life due largely in part of harsh living conditions and beliefs that have been beaten into her. With these beliefs come the distrustful nature of others whenever she is around others. Unsure of their true motives behind what drives them forward. From those who casually know her would consider her stubborn, irrepressible, and straightforward without a care in the world. Slythe tends to only tell you the facts from her observations but doesn't get too intimate with ideals and beliefs. Though under the rough exterior, to the few Slythe really shows, she is actually rather timid, affectionate, and soft spoken. Even with a slight humble outlook when watching how the beauty of the upper world has lived and seeing everything come into play as one. Eons ago in lands far away from this one there was a tribe; rather primal in nature building structures out of large smooth stones and speaking a native language that has long since been lost in time. This tribe, known as Stalkkeri, was a proud people basking in what sunlight had drifted down from the brilliant blue skies; Living in a harsh terrain somewhat like a mixture between a barren wasteland and that of a Northern climate. Life for them was mostly good for an ancient tribe, yet hard times were just around the bend. Soon their good times came to an end when a larger more industrialized tribe moved into their territory hell bent on taking over what land they could making large metal structures and forcing the rather peaceful Stalkkeri tribe off of their lands. While time passed the lands began to get smaller, and smaller until there was no where else for the tribe to go. Stalkkeri's were taken into slavery and forced to dig mines down into the center of their realm. Never allowed to view the sun or feel its rays against their hides to know light as they remembered it. After years of torture and slavery the Stalkkeri's began to grow accustomed to the darkness. Their normal exteriors turning, changing, and morphing through the generations. 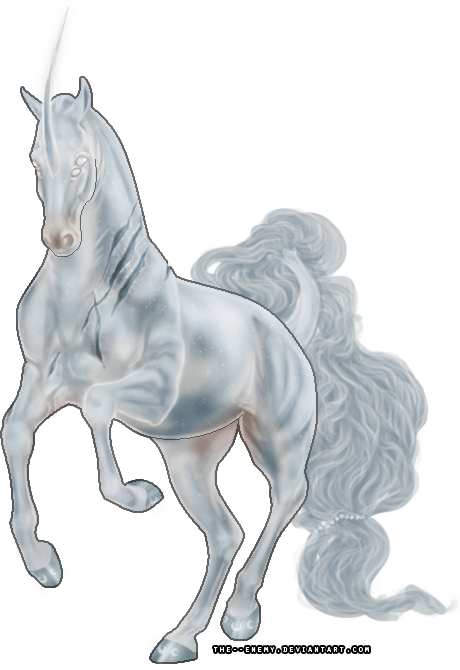 Once natural coats now turned dark no longer were they the lighter natural equines that they had once been, and none remained lighter colors. Bioluminescent began to seep into their veins, various portions beginning to glow and radiate in the darkness of the caves offering them the very little light which they worshiped like the sun. This ancient tribe was no longer praising the sun and all the glory in which the warm rays touched. 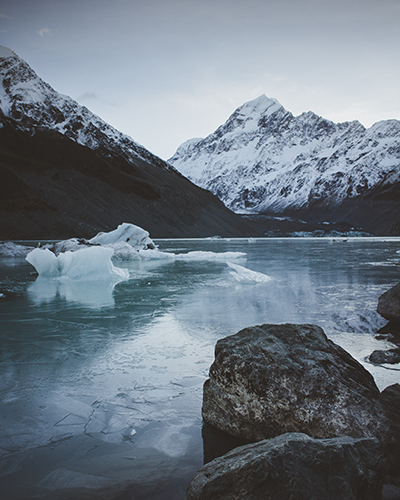 Instead they began to let the cold and dark seep into their minds tainting their hearts and swarming through their minds. Where they had once focused on mushrooms, and what edible plant life they could find in the caves were now long forgotten and instead their appetites changed to that of life-blood. Eons later the ones who had put the original tribe into slavery has long since vanished from the face of the realm, but it was not just of their time. Instead they were devoured by the Stalkkeri clan living within the various caves. Nothing remained aside from the various caverns that had been forced to be dug and the large metal structures dotting through the surface of their world. What wildlife had been left was now gone, destroyed and even the skies remained black as night. Instead of returning to the surface the Stalkkeri tribe kept to the underworld. Their once peaceful nature turning to that of violence. Their gentle psychology twisting into arrogance, ambitiousness, sadistic, treacherous, and hedonistic. Yet still the equines remained proud as they had once been generations prior. Through the generations many noble clans had come and gone, each one being torn down and each of their members slaughtered. No longer feeling the compassion or love like they had before. Distrustful sadists with a readiness to back stab whomever stood in their way, both figuratively and literally. Children who showed kindness, compassion, or even love were brutally punished to beat the instinct for cruelty into them. When Slythe had been born, she was an oddity among her entire tribe but she was lucky enough to be born into the center of the Mitätön clan which at this time would have fallen in the fourth running place out of the eight clans that remained. A strange thing had happened the usual dark coat was nonexistent in this child, instead it was lighter almost ethereal. An off-white near translucent hide was what she was gifted from their deity of the dark. Keeping the two sets of eyes and the shorter unicorn tail bound by the mass of hair at the end that she had inherited from her parents. Jealousy overwhelmed her mother and elder siblings each had wanted to sacrifice her to their deity, but mother didn’t allow it. Instead mother saw this as an opportunity to shape her into something she could use against all the other clans. As a foal, Slythe had gone through a rough life. That is not stated lightly as she had been taken from her mother only able to see her for brief periods of time, mostly raised by caretakers and her older siblings. Whenever Slythe had shown compassion for a living creature her caretakers (or older siblings) would slaughter it and turn to beat her. Slythe grew accustomed to this as a child and since then had refused to show the compassion she held deep down in her heart. The scars from her elder sisters whippings had already begun to scar her back and haunches. The darkness was seeping into her innocent soul tainting her as It had all the others. While she grew each year she had learned something new of her people. Their deity encouraged fighting among the families, especially in the noble clans. Slaughtering their own children for whatever gain they could get from both the deity and the anger from whomever they were threatening. Slythe also found out that women were prized far more than the male gender, a matriarch role as her mother sat atop her throne looking down on all the others. Males had been nearly worthless and if one man stood up and tried to win the hand of a woman she would have had all the rights to slaughter him where he stood. The only time a man would not be punished was if the woman had gone to him first and foremost. If two females found interest in the one man they would rival the other, and if one got bored and no longer found interest he would be skinned alive and thrown in front of their rival. A sadistic vengeful world she found herself living within. Slythe, as she grew older, refused to show any interest in the opposite gender. Somewhat afraid she would be used against the other clans to try and better the one she had come from. The brilliant horn that now grew from her face and the unique coloring of her coat would gain admiration from these other clans, jealousy sparked within them and they wanted her too. Several suitors were placed before her, many of the upper nobles wanting nothing more than to add her in with their own male offspring. Yet she still refused to show interest due to the reasons of the other clans matriarchs; Slythe was not a prize to be held. She wanted the compassion that was not openly shown kept in secret, but none were willing to show that side. When Slythe refused to take a man as her own, she was beaten by her her own clan, Mitätön, and patronized by others. Offering the finest of males from the higher clans, and still refused was something unheard of. Slythe was began to wonder whether this place, this home, was right for her. Wondering what else was on the outside wanting nothing more than to make her way back to the surface to see what still lay beyond. She began to explore the underworld city having a shadowed guard that followed her wherever she went placed there by mother to watch her every move. Slythe stayed for another year at least until a male of a more noble clan tried to win her hand in a dark alleyway. When the man refused to take no for an answer he lashed at her hoping to rile her up enough to consider him as a possible patron. Slythe tried to flee into the open streets but was pulled backward feeling a blade against her cold skin and the cool trickling of her own fluid. Out of fear she lashed out at the man blinded by the rage that had been building for quite some time and slaughtered him in the street. She watched as his vibrant red liquid seeped from his cooling body and decided there was no way she could continue living within the darkness and decided then she would escape. The highest clan, Tarkkailija, deemed this dead man as their own and upon hearing that Slythe had left the tribe they'd sent a search party after her. By this time she had already been gone for several days and her trail was beginning to fade away. Wanting nothing more than to leave this horrid life behind her and search for greener pastures, but due to events in her life she is extremely timid of those who live on the surface and is unsure of herself and the social customs. After a century of wandering the endless tunnels Slythe had finally found her way out of the caverns and into the moonlight of the surface world. Everything that the slavers had built eons ago were now in crumbling ruins while the plant life began to over grow what was left. She ventured into the darkness with no real place to go but had decided to wipe her clans name, Mitätön, from her own calling. That life was now left behind, even if it had been everything she'd ever known. Decades she traveled and wandered helping those she could along her path. Still she had not found a place where she considered staying for too long afraid the Stalkkeri were still on the search for her. Knowing how much they had prized her for her appearance, but she'd wanted more from that life. More than what their deity would have allowed. Spending too much time within her thoughts allowed her guard to drop. Four scouts from the Stalkkeri had found Slythe wandering the darkness they had taken this chance to ambush her knowing she had never been much of a skilled fighter. Where she had tried to fight back she was not able to take all four of these equines on by herself. One scout had been from the Xhosa clan, Slythe had realized as they all carried an irregular X shaped scar or marking depending on whether they were caretakers or those born within the clan. He carved an X into her into her flesh claiming her for his own clan, but before the other three scouts could carve their clans calling into her hide someone from the shadows stepped in. Within mind shattering minutes this unknown equine fought against these scouts, as far as why Slythe was unsure. She had exhausted herself to the point of collapsing only watching as one after the other began to fall and only the stranger remained. What was to happen she was unsure, but her mind would not allow her to stay awake any longer. When Slythe awoke she was somewhere unknown to her, but the stranger still remained. For a time things were uneasy for the pair to say the least. Part of her wanted to carry on how she had been living the last decade, but at the same time she felt as if she owed something to Vithmiris. Instead she stayed and within that time she'd come to realize that those living on the surface were quite different than those within the caves. Vithmiris may have seemed like some badass outlaw on the outside, but there was much-much more to his inner workings than what most, if not everyone, had seen. 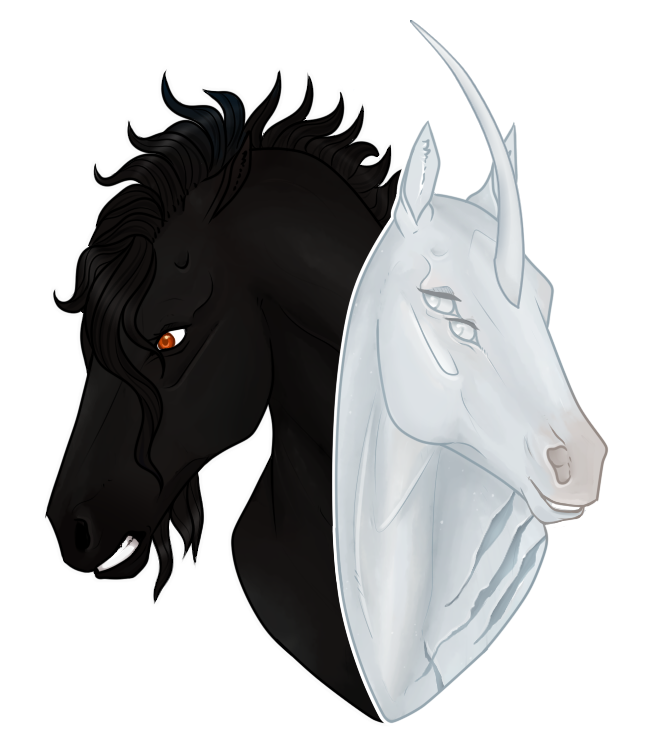 Slythe had begun to develop so called feelings for this equine and decided to stay around much longer than she would have thought otherwise; discovering more about him with each passing day. It had been several years into their journey together where Vithmiris and Slythe had claimed a place of their own to live. It was there in this strange island that Vithmiris had created a place known as the Bloodfall Citidel. He wished to shower Slythe in the luxurious lifestyle he had known and preferred. Vithmiris had been crowned the king, but commonly known as the vampire king. It was very rarely any beating hearts could be heard within the citadels walls. Life within the Citadel was fine, for a time. Vithmiris and Slythe had visited all there was in the surrounding lands. Though it was becoming a bit too boring for Vithmiris's tastes. Somewhere within the time of Vith's ruling he had been challenged for his crown, his home. He'd defended of course while the challenger slunk away with their tail between their legs. Bloody, battered, and bruised as one would have expected, but even then life was becoming drab. It wasn't until Slythe had been sent of with a servant of sorts to find a new place, somewhere that seemed a bit more lively than the dead fish they were surrounded by. Her womb swollen with two children of Vithmitis's Slythe found her way to this island to wait for the one she claimed as her own. What would the future entail for them here? No one was certain, but it couldn't be good for those unfortunate souls that found their way within the line of fire. Slythe, like many of her kin, had an affinity for magic. Whereas others of the underdark partook in magic for artistic purposes or self defense, both herself and her kin used it for offence and destruction. Though only those born from noble houses, much like Slythe, were able to harness the ability to its fullest extent. It seemed her magic only continued to blossom far beyond what any of her kin may have thought possible, and it was reinforced when she became a vampire. As she learned how to weave her newfound skills with those of one’s she’d known it would seem she has become a force to be reckoned with. Originally before Slythe ever became a vampire the only way to heal oneself was through medical remedies, or by the blessing of the spider queen. Though once she was out of the clutches of her kin’s beloved deity she had found that there was much more to be learned. Vith whom had taken a liking to her showed her much of what this surface world had offered. Including his own almost unbelievable transformations to wounds he received. After transforming into a vampire she was able to share the regeneration powers that Vithmiris himself held. Finding that she could repair whatever wounds she received but the length of time depended on how injured she had become. Minor injuries heal only moments after, while severe injuries take up to a few days depending. Though Slythe had found she can heal wounds quicker with blood she ingests, and quicker still if she ingests the blood of Vithmiris. A unique ability which came with her own heritage was the ease of compulsion, or otherwise another form of mind-control. One reason her kin still try to bring her back into the underdark back to the dark society ruled by the evil spider deity. She is able to extort valuable information from her targets, or even their deepest darkest fears if she so desires. An easy way to learn of her new surroundings, or finding her next possible meal. Slythe is able to easily erase memories covering them up like they had never existed, or even making them remember something completely opposite. She finds this enjoyable as she sits back and watches the scene unfold before her. A unique, and terrifying, gift that she had been blessed with at a very young age and has since learned to control it knowing what forces lay beyond the reach of the surface. Pain. Regardless of the type of injury Slythe feels every second of it until it is fully healed. Minor scrapes seem to heal within a matter of moments while the pain inflicted is minor. Easily brushed off, but as the wounds increase in severity so does the pain that it brings. Deeper gouges, fractures, and beatings tend to leave longer lasting pain taking hours to heal. Broken limbs, torn muscles, and gouges that would have easily killed a mortal being bring Slythe writhing in pain as her body works to heal the wounds. These can take up to days, or weeks, to heal while it seems like an eternity in agony. While compulsion seems like an easy feat, there are consequences to using her gift too often. Every time she taps into her heritage magic she can be located by her kin and the deity. Often times resulting in a sort of mental assault to overwhelm her senses. She tends not to use it unless she absolutely has to afraid to see a battle unfold between those that will never give up, and those who would never see her leave. Aside from the potential wrath of the underdark Slythe also tends to get light-headed, or light sensitive, whenever she uses this type of magic as it puts a strain on her own mental well being. Along with becoming a creature of the night, Slythe has since received a few of the same gifts Vithmiris himself had given. While Slythe was a beautiful creature in life, that has since magnified in becoming a predator; Giving her the ability to lure unsuspecting men and women into her trap allowing for an easy meal. Another beloved gift was that of her canines able to grow at will, under intense circumstances, great stress, or the sight or smell of blood. With this curious little aspect as a creature from the underdark, Slythe’s transformation was a bit unsettling the first time seeing her reflection. Her milky-white eyes were now pitch black coupled with black veins rolling through her pale facial features, an off putting an eerie scene to behold. A predator lurking under the pretty face. Due to the curious nature of her being she now relies on the blood of others to survive. As Slythe is still considered a young vampire she struggles with the lust for blood. More often than not accidentally killing her victims in the process draining nearly all of the fluid from their corpses. There may have been something that drew the black jaguar to the pale woman in the beginning. Perhaps it was the alluring aurora she had expelled peaking the creatures curiosity, or perhaps it was the warm inviting nature the woman held about her. Though Xunril watched her for a time following both the pale woman and her counterpart an equally dark creature he’d known as Vithmiris. Keeping his distance and watching from afar how their courtship, if one could call it that, ravished in the strewn bodies caking themselves in the red oozing liquid. Finding himself curious he ventured closer, but he would have never expected such a warm welcome bidding him closer. Was he to be the next meal? Not by any means. It was that day, Xunril had given his name. The beginning of a bond to the pale woman that only began to strengthen. 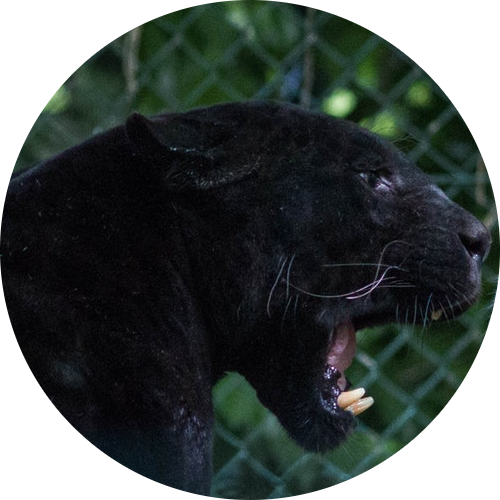 Xunril is a very large, and heavy, black jaguar. Weighing nearly 100kg (220lbs) while his length from the tip of his nose to the base of his tail measured 1.85m (6.1ft). While he has quite a stocky build his limbs are short, but muscular able to tear the flesh off an unsuspecting person with a simple wide swipe of his paw. Due to his robust build he is especially capable of climbing, crawling, and sneaking. Many might think a black jaguar would be able to be overlooked by others, he can easily sneak through the shadows with his wide paws making very little sound and unable to be seen. A powerful ally, and a loyal friend.